Resources to teach strategy game design - Welcome to kathleenmercury.com! Looking for resources to teach game design? You found them, you googling wizard! When I decided to start teaching kids to design games, I scoured the internet and had a hard time finding good resources. I cobbled together what I could find, and then over the years have changed, added, modified, and created so much new stuff that I thought it was a shame that no one else could see it or use it. I thought about publishing them in a book, but that's a stagnant resource with little reach. Plus, given my cobbling together o'resources, despite all my work, I can't say with 100% that everything is entirely original to me. Most importantly, I feel as though I've benefited from the hard work of so many gamers, game designers, publishers, and other educators to create these resources, and I want these resources to be free to remove any impediment towards using them whatsoever. With that in mind, I love sharing and collaborating! Shoot me an email if you plan to use anything, and I can help you shape your units, whether a three hour workshop or a semester-long class like I use. This is me at Rivendell in New Zealand. I wish I had taken off my shoes. ​If there is one thing that I would teach for the remainder of my career, I would teach game design because it's the most comprehensive, challenging, real-world, and fun unit ever. You want theory? It's a Robert Sternberg Triarchic Theory dream--creative, practical, and analytical. Check out the video I made about the theory for one of my Masters in Educational Technology classes. You can hear my angelic voice. You want design thinking? Empathy, iterative design, collaboration, feedback. You want to address common core? Writing rules covers so much in terms of English Language Arts, especially Informative Text and Procedural Writing. My only request is this: If you use any of these materials, please share with me what you used and how you used it. If you share back with me any changes that you've made, that would amazing and I'll post them too. The only thing you can't do is take these materials and publish them yourself. So not cool. Technology is a great liberator, and in this era of online collaborating and crowd sourcing, I want to provide to teachers, who may not have access to challenging materials for gifted middle and high school students, all my stuff for free. Any one can use it, really. Home schoolers, hobbyists, video game designers (the process is similar, just different outputs)...just give credit where credit is due. You don't want to make Ragnor up there angry. One last thing, if any student (or teacher, or random other person finding and using this information for their own purposes) publishes a game, let me know, and put me in the credits. I get to have a little bit of an ego, after all. I'm glad you found my site! Enjoy! Shoot me an email. I'm hilarious and helpful. I made this video for a master's class, but I like how it explains what I think gifted classes should focus on developing in children. I went to Scotland. This is the Glenfinnan Viaduct stone bridge featured in Harry Potter. 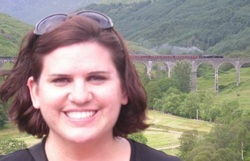 I am smiling like a fool in this picture because not only is it the Harry Potter bridge, but the Hogwarts Express itself is crossing the bridge behind me. I like to call this the greatest day of my life. Waiting for the train meant that I was trainspotting in Scotland. So many life goals unlocked at once!